Histoplasmosis is a disease caused by the fungus Histoplasma capsulatum. This fungus is found throughout the world, but is endemic in the Mississippi and Ohio River Valley areas of the United States. This fungus is found in soil where bird and bat droppings have accumulated including chicken coops, caves and in old buildings. People who live or work on farms, landscapers, construction workers, and others who work outdoors can be exposed. The fungal spores become airborne when the soil is disrupted and are inhaled into the lungs. It usually produces only mild flu or cold like symptoms, so the person may be totally unaware that he or she has been exposed to Histoplasmosis. However even though the systemic symptoms are mild, it can cause a serious retinal condition called Ocular Histoplasmosis Syndrome (OHS). OHS is a leading cause of blindness in the 20 to 40 year old age group and affects men and women equally. Most people with OHS are unaware that they even have any retinal signs and approximately 5% of people with OHS are at risk for having severe vision loss. In older patients, OHS may occasionally be misdiagnosed as macular degeneration. 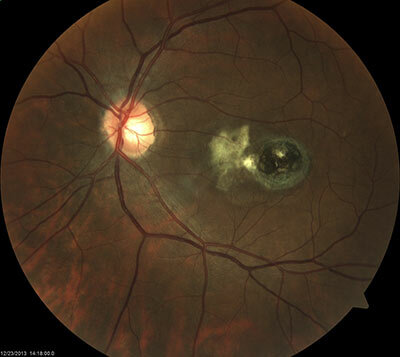 The Initial Infection: The fungus, after being inhaled, travels through the blood vessels into the eyes where it can cause inflammation and scarring in the peripheral retina. These scars usually do not cause visual problems and are called “histo spots”. Histo spots vary in number, but can usually be seen in both eyes. Affecting the Macula: Vision loss from OHS can occur when the central retina or macular region is involved. When abnormal blood vessels grow or fluid leaks into the macula, it can lead to severe scarring and vision loss. 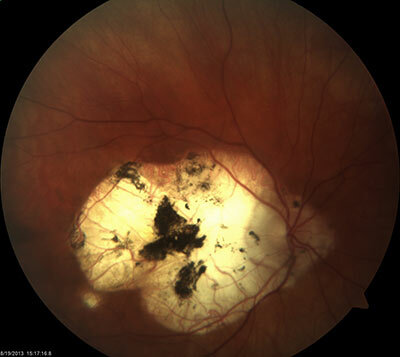 The vessel growth is called a subretinal neovascular membrane and can be present in one or both eyes. Most often vision loss due to OHS occurs in one eye allowing the patient to function normally with the other eye. However if and when the other macula develops a neovascular growth, more severe visual problems develop including difficulty reading, writing, and driving due to the loss in both eyes. Stress Effects on Further Vision Loss: OHS may reoccur even up to decades after the original onset. Many factors may cause this. The most noted is stress. As mentioned before, many people are unaware that they have been exposed. Then during times of illness, stress or changes in their emotional state causes an activation of the disease which leads to abnormal vessel growth under the macula. Patients must avoid high stress situations. Wavy Distortion in the Vision: A visual distortion may be the very first visual symptom of OHS. Because there may be an abnormal blood vessel pushing up the retina and/or damage of the macula, words or lines may appear wavy or distorted. This condition called metamorphopsia is due to the stretching or distortion the retina. People complain that their horizontal blinds are wavy, telephone poles have a bend in them or the lines on a paper are not straight. How should a person with OHS check to make sure their condition is not progressing? Each day you should check for differences in each eye on an Amsler Grid. Decreased Central Visual Acuity: When OHS affects the macular region and causes scarring, there is a decrease in the center of our vision. Our macula provides us with our central and sharpest vision. With damage to this area, reading and seeing detail becomes difficult. Dense scarring can cause a blind spot or dark gray spot in the center of vision. This spot can create many problems when reading and looking at faces. Many people experience “come and go” vision, where they see the object clearly and then they lose it. This is because when you look straight at the object the blind spot blocks it and then you turn eye slightly to use your peripheral retina and are able to see it more clearly. Eccentric Viewing: By turning your eyes or head to one side or the other a patient may be able to see detail more clearly. This is known as eccentric fixation. This turn of the eyes or head moves the blind spot out of the way allowing them to use the surrounding peripheral retina to pick up more detail. Unfortunately, our peripheral retina does not have the vision capabilities of our macula and cannot provide sharp 20/20 vision. Loss of Color Vision: The macula is primarily cone cells which are responsible for color vision. When these are damaged as in OHS, color perception is impaired. It can range from a mild to a severe color vision loss depending on the location and severity of the macular damage. Decreased Depth Perception: Any problem with vision can disrupt a person’s depth perception. Depth perception is a very sensitive visual function requiring that both eyes be functioning together. A decrease in acuity in one eye due to OHS is enough to impair depth perception. Photostress and Photophobia: When coming indoors from the sun, your vision may be decreased and have a darker and larger blind spot. This is called photostress. When we go out into bright sunlight, our retinal cells get bleached by the light. Normally, it takes a matter of 20-30 seconds for the cell’s chemicals to be replaced and our vision is affected only momentarily. However when you have damaged cells, it can take up to 10-20 minutes to recover. Another problem may be photophobia, a general light sensitivity. This can be from sunlight to bright indoor lighting. The scarred macula acts as a reflector scattering the light throughout the retina making a person more light sensitive. Filters may be used both inside and out to help control glare and light problems. Vision Fluctuations: Patients may have good days and bad days with their vision. Additionally once a person has been diagnosed with OHS, excessive stress has been known to cause an activation of the abnormal vessel growth and progression of central vision loss. Home Monitoring: All patients who have been diagnosed with OHS should check their vision daily with an Amsler grid. The risk of reoccurrences may reduce with time, but is still a significant risk. If only one eye is initially affected, the unaffected eye must be monitored closely. There is an especially high risk for the second eye to become involved in the first five years. If any new waviness, distortions or areas are missing, then you should get to your eye care provider immediately. Medical and Surgical Care: Treatments including steroid injections, laser treatments and new medications have been proven to help decrease the amount of vision loss and scarring from OHS. Sub-retinal surgery may be used to remove abnormal vessel nets under the macula. Low Vision Care: OHS patients usually respond well to low vision care. If only one eye is impaired, safety eyewear is advised to protect the remaining functional vision in the good eye. If both eyes are visually impaired, high powered reading eyewear, magnifiers, closed circuit television magnification systems, sun filters and environmental adaptations may be helpful. You may reach Drs. Rich and Laura Windsor at the Low Vision Centers of Indiana at (765) 348-2020 or email richw@eyeassociates.com or drlaura@eyeassociates.com.